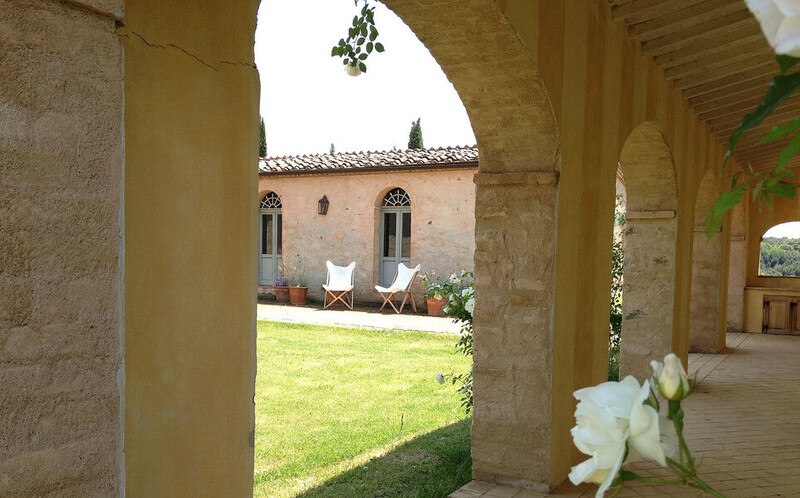 Lavacchio is an amazing property with private swimming pool comprising a big stone house and a guesthouse, set in a totally peaceful location close to Montalcino and Siena. It embraces what is considered one of the most gorgeous panoramas in Tuscany. The renovation of the property has been conducted by its new owner, a renowned interior designer from Milan, and this shows in the splendid but welcoming decor. The spacious interiors have been painted in warm colours and tastefully furnished with high quality pieces of furniture and objects. All bedrooms, except one, have an en suite bathroom. 2 famous wineries, Castello di Banfi and Camigliano, where you can eat in the trattoria and buy the famous Brunello di Montalcino, are only 3 - 4 km away. Restaurant and enoteca in walking distance. In Sant'Angelo Scalo, 4 km away, you can find a groceries. First Floor: Sitting room; master bedroom with four posted bed and en-suite bathroom; double bedroom with en-suite bathroom; twin bedroom; double bedroom, bathroom. All bedrooms on this floor have air-conditioning. Ground Floor: Twin bedroom with en-suite bathroom.